Soften ingredients. Blend and add cut-up shrimp. Serve with chips or crackers. 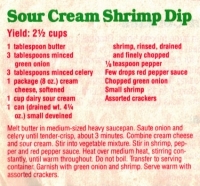 Recipe categories: Appetizers, Dips, Shrimp.